Four robots move in a warehouse. As they have no brakes, they must rely on obstacles such as walls and other robots to to stop. Once stopped, they use nozzles to move in a direction away from that obstacle, allowing them to turn. From time to time, they receive a request to move to one of the 17 targets in the warehouse and they rely on the players to provide them with instructions to move to the targets. 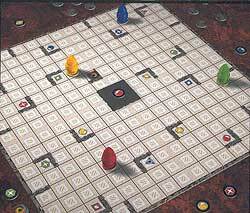 Each turn, a player draws a chip to determine the next target and the robot that mus t reach it. The players search for the shortest moves to the target, using one or more of the robots. The player who finds the shortest route receives the chip as a reward. The player who takes the most chips, is the winner! Any number of people can play this game, making it a great group game!